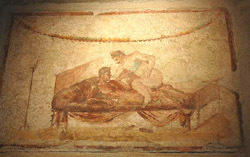 The Lupanar was the official brothel of Pompeii. As a trading town, it was visited every day by a large numbers of people, especially traders from other towns. The brothel is situated at the intersection of two side roads on Via dell’Abbondanza near the town centre, not far from the Forum and the Stabian baths (which had a rear. entrance on the Vicolo del Lupanare). Phalluses engraved on the basalt road surface or on the stone set into the facades of houses gave visitors clear indications on how to reach the brothel. We find explicit reference to the use to which this building was put, unlike many other brothel in the town (there were probably 25 in all) which were situated on the first floor above taverns and houses. The lupanar had ten stone beds with mattresses, each bed set in its own small room. Five of these were found on the ground floor, while the larger rooms were situated on the first floor which could be reached by an independent entrance and a wooden staircase. The customers expressed their opinions on the brothel and the performance of the prostitutes by scratching them on the walls, as can be seen by the approximately 120 examples of explicit graffiti. The brothel was managed by a “leno” (an owner of prostitutes) who bought the girl as slaves, primarily in the East, at an average price of 600 sesterces. The brothel’s tariffs varied from 2 to 16 asses (1 as equal to about half a sesterce).